At first glance, the recent — unprecedentedly acrimonious — G7 Summit had a silver lining: it seemed to demonstrate that Canada enjoyed the solid support of the EU in its defence of liberal internationalism. In response to President Trump’s ad hominem argument against Prime Minister Trudeau, a spokesperson for the President of the European Commission, Jean-Claude Juncker, stated that the European Union stands fully behind the G7 communiqué agreed to in Charlevoix, and will continue to stand up for an international rules-based, multilateral system. This is important, particularly in a situation in which Washington is increasing its attacks on the liberal international order. This means that it is now particularly important for Canada, as a country that defines itself as a middle power built on liberal-democratic norms, to work closely with like-minded states in an effort to defend the multilateral order from an unusual suspect: the country that played a crucial role in setting up that order. In this confusing international political environment, the support that the European Union (EU) can potentially provide is invaluable. Canada should co-operate closely with the EU in defense of liberal internationalism wherever possible — upholding multilateralism and opposing Trump when he engages in destructive behaviour, as he did at the G7 Summit. Yet, a dose of realism is necessary: the EU’s support will not be as unambiguous as Juncker’s statement might suggest. The EU’s ability to play a constructive role in defending the international liberal order is constrained, above all, by its internal divides and tensions. Those tensions are at least in part linked to the growing power of illiberal ideas and political forces in Europe — first Hungary and Poland, and more recently Italy. Similar to Donald Trump’s administration, the governments of those countries have launched virulent attacks on core liberal-democratic values and institutions, both domestic and international. They have also embraced nationalist political platforms that will seriously complicate the EU’s ability to effectively address a multitude of problems and challenges. To illustrate this point, consider — from a long list of internal tensions in the EU — the recent row between France and Italy over how the Union should handle refugees. A day after French President Emmanuel Macron said Rome had acted with cynicism and irresponsibility in turning away a migrant rescue ship, Italy’s hard-line new interior minister, Matteo Salvini, insisted his country had nothing to learn from anyone about generosity and solidarity. The case has aggravated a bitter debate in European politics: how to share responsibility for migrants trying to enter the EU from conflict zones and poor countries, mainly across Africa and the Middle East. In the coming months, the issue of migration can be expected to generate renewed clashes between supporters of a liberal vision of Europe, like Macron, and radical conservative, populist governments. Those governments flatly reject refugee redistribution schemes proposed by Brussels, and regard Merkel’s 2015 “open door” policy as a threat to national and European security. The resentment generated by those clashes could easily spill into other issue areas, accentuating internal divides in Europe. This, combined with the uncertainty and difficult questions over Brexit, means that in the coming years the EU will likely be too divided and focused on its own problems to consistently play the role of defender of liberal internationalism. To put this into a broader perspective: the rise of illiberal, radical conservative political forces on the “old continent” also risks undermining another international institution — this time, one in which Canada is a member: NATO. Take, for instance, the challenges posed by Turkey’s recent political evolution. Turkey has long had a complicated position vis-a-vis the liberal-democratic values around which the Alliance defines itself. But, since its inclusion in NATO, Ankara has never been as explicitly critical of Western values as it is under the current administration. In recent years, Turkey’s ruling AKP party has moved towards increasingly authoritarian measures — especially in the aftermath of the 2016 military coup attempt. Under President Erdogan, who emphasizes traditional Islamic morality and presents himself as a conservative democrat, Turkey has also adopted a series of deeply problematic foreign policies. Suffice it to mention Ankara’s growing co-operation with Russia, including the purchase of a Russian surface-to-air missile system, which raises questions about the reliability of Turkey as a NATO ally. Yet, it is difficult for NATO to speak with one voice in responding to challenges posed by Ankara’s behaviour when some member states (governed by radical conservative parties) explicitly support Erdogan. For instance, the leaders of Hungary and Poland have expressed gratitude for Ankara’s role in “protecting” Europe from large waves of refugees, mostly those coming from Syria. In their view, that protection is much more important to national and European security than Turkey’s (non)compliance with liberal-democratic norms. Here, as in the case of debates over migration within Europe, disagreements over specific actions and policies reveal — and reinforce — more profound clashes between liberal and illiberal visions of domestic and international order. Those clashes have also translated into a situation in which conservative European governments, most notably Poland, seek closer security co-operation with Washington, often siding with like-minded President Trump in criticizing West European allies for shirking NATO spending targets. Such criticisms — reminiscent of the divide between “old” and “new” Europe witnessed during the Iraq War — raise further questions about the strength of allied solidarity. That solidarity will continue to be tested in the future, as allies with increasingly diverging views of politics and security will need to address contentious issues ranging from military spending to the NATO/EU relationship, and the Alliance’s stance vis-a-vis Russia. 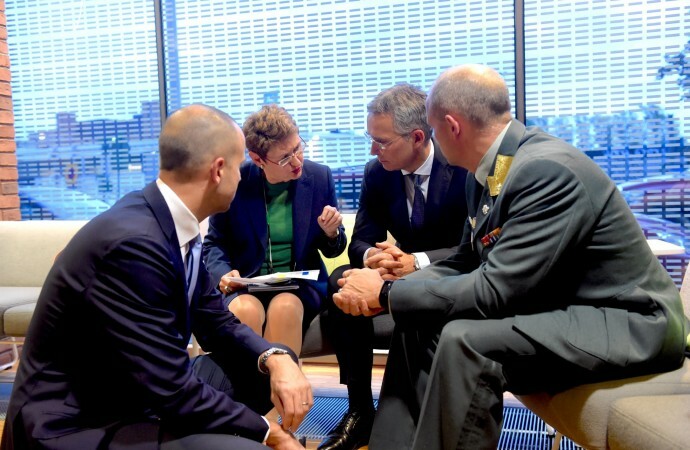 It is too early to predict if NATO will remain united in the face of such tests, but it is not too early to argue that its resilience (or lack thereof) will have a major impact on the future of the post-World War II multilateral system.